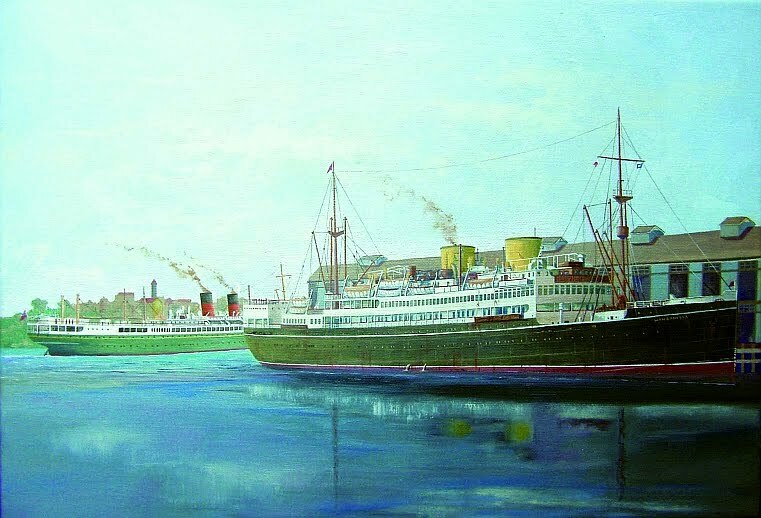 This Stan Stefaniak painting was produced for the book Wanganella and the Australian trans-Tasman Liners by Peter Plowman, but we didn't use it for the New Zealand edition as we felt it was not dynamic enough. However, it was used on the cover of the Australian edition. It shows the Wanganella in the foreground and the Monowai behind in Sydney Harbour in the 1950s. 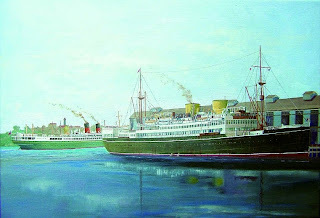 Both vessels made the 3 day "ferry" crossing, but Wanganella was owned by the Huddart Parker line (Australian) and the Monowai by the Union Steam Ship Company (New Zealand). These two companies were effectively the only operators across the Tasman Sea. The passenger service had increasing competition from the airlines after WW2 and ceased in the early 1960s.